If you’re interested in ionic liquids, why not take a look at the recent cross-journal promotion Incredible ionic liquids: an article collection. You can keep up to date with all the latest developments across the chemical sciences by signing up to your favourite journal e-alerts or following them on twitter! Luminogenic materials are a hot topic of research due to their potential applications in biotechnology and memory systems. But most luminogenic materials undergo aggregation-caused quenching (ACQ) in the solid state. This is when the dye molecules near each other aggregate and form species that weaken the material’s emission. Ben Zhong Tang and his team have been researching materials that instead exhibit aggregation-induced emission (AIE). This makes the preparation of solid state luminogens much simpler as aggregation increases the activity. Unfortunately, there are few AIE-active emitters in the longer wavelength region, which is of interest for biotechnology applications. Tang’s team have addressed this oversight by developing a novel luminogen which couples the AIE property of tetraphenylethene and the longer wavelength activity of a hemicyanine dye. The emission properties of the resultant crystals can be readily tuned by the solvent molecules in the solution they are grown from. Most interestingly, the prepared luminogen shows crystochromism: a strong yellow emission in its thermodynamically stable crystalline form and a red colour in its metastable amorphous form. These changes are fully reversible, with grinding, heating or fuming causing the change in the luminogen’s crystallinity. Lysosomes are cellular organelles that contain enzymes which break down cellular waste, a bit like stomachs. They have an internal pH of 4.8 and maintain this acidic pH (compared to the cytosol, pH 7.2) by pumping protons across the membrane. Changes in lysosomal pH can indicate the onset of disease. In fact, elevated lysosomal pH has been noted in several lysosomal storage diseases. This group of around 50 rare, inherited, metabolic disorders result in symptoms such as seizures, deafness and/or blindness. 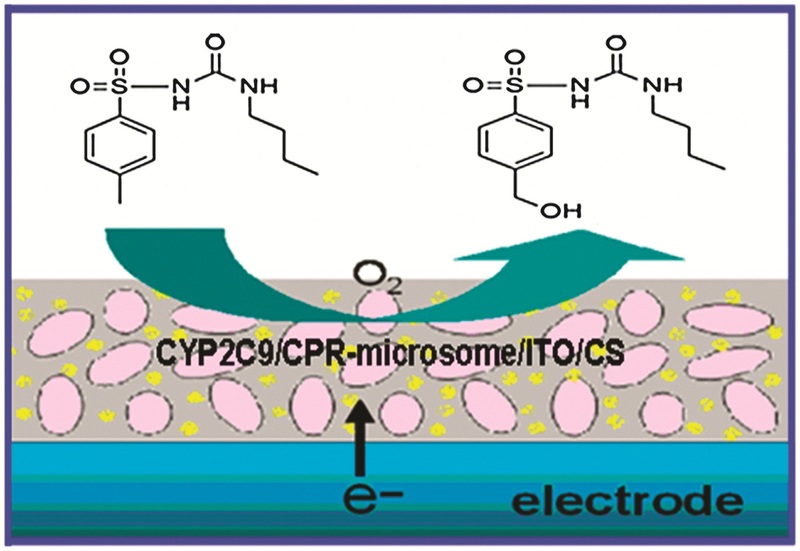 Now David Parker and colleagues at the University of Durham have designed responsive, low molecular weight probes which can permeate the target organelle and report the pH using a ratiometric signal. The probes could help evaluate the impact of drugs created to treat lysosomal storage diseases. The team made europium and terbium complexes of two structurally related ligands that contain a sulfonamide moiety which acts like a switch, reversibly binding to the lanthanide and changing the metal coordination environment. The change is signalled by variation of emission spectral form and relative intensity and also modulates the circular polarisation of luminescence as the local helicity at the metal centre switches. Testing in a range of cell lines and altering the pH of the cellular and intracellular environment, the researchers developed an emission intensity ratio method using lanthanide luminescence which can be used to assess lysosomal pH variation for the first time. Find out more by reading their ChemComm communication, free to download for a limited period. Times have changed since David Parker wrote his first ChemComm on a typewriter. He discusses his research path, chemical prostitution and targeted devastation in his ChemComm interview. 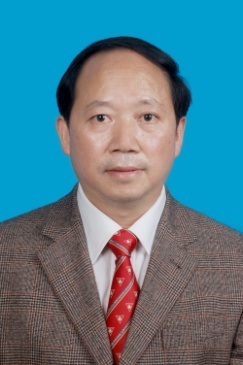 On behalf of the ChemComm Editorial Board, I am delighted to welcome Professor Yong-Qiang Tu as the new ChemComm Associate Editor for organic chemistry. Professor Tu is a council member of Chinese Chemistry Society and the president of Gansu Chemistry Society. His current research interests centre on tandem rearrangement reactions and their application to the total syntheses of bioactive alkaloids, synthetic studies of biologically active natural products, and the construction of C-C and C-N bonds via C-H functionalisations. Professor Tu’s editorial office is now open for submissions, welcoming urgent communications highlighting the latest advances in organic chemistry. Are you an organic chemist based in North America? Submit your research to Michael Krische, ChemComm North American Associate Editor for organic chemistry. Scientists in China have developed a quick and clean way to reduce nitroarenes to aminoarenes, which are common intermediates for making dyestuffs, pharmaceuticals and agricultural chemicals. Sodium borohydride and molecular hydrogen are commonly used for this reaction but their hydrogen elements cannot reduce nitroarenes under mild reaction conditions. Usually, expensive noble-metal catalysts are necessary to activate the hydrogen elements in the reductants. Here, the researchers have used a vanadium-doped porous TiO2 with highly active hydrogen, which can instantly (<10s) and selectively reduce nitroarenes to aminoarenes under ambient conditions without catalysts. After being consumed by nitroarenes, the active hydrogen species can be regenerated by irradiating the V-doped TiO2 with UV light. Fancy submitting an article to ChemComm? Then why not submit to us today or alternatively contact us with your suggestions. 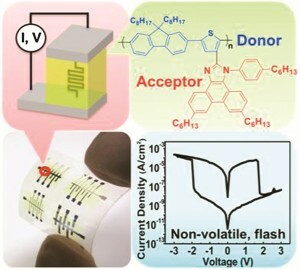 Scientists in Taiwan have made a flexible memory device, which they say could open up a new design approach for high performance flexible non-volatile resistive memory devices. Non-volatile devices are computer memory devices that can retain stored information even when not powered, for example read-only memory, flash memory, hard drives and floppy disks. The team’s device consists of a single-layer donor-acceptor conjugated polymer fabricated on plastic polyethylene naphthalene. It displayed a low threshold voltage (±2V), low switching power (~100µW cm-2), large on/off memory window (104), good retention (>104s) and excellent endurance against electrical and mechanical stimuli, they say. Scientists in the US have reported a new type of conducting polymer, generated by a ROMP (ring opening metathesis polymerisation) reaction. The new polymers could have potentially useful properties, they say. They reacted the complex (η5-C5H5)Ir(η4-C6H6) with Grubbs’ catalyst to give a polyacetylene consisting of cyclopentadienyliridium bound s-cis butadiene moieties separated by C=C linkages, a previously unavailable polyacetylene type. A way to study drug metabolism using cytochrome P450 enzymes (which are involved in the metabolism of over 60% of clinically used drugs) has been developed by scientists in China. The team made a film of indium tin oxide nanoparticles (they have good conductivity) and cytochrome P450s encapsulated by chitosan (which are biocompatible) on a carbon electrode. 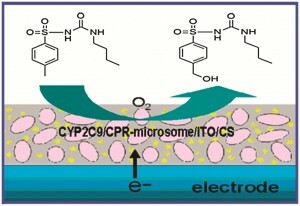 They were able to bioelectronically initiate cytochrome P450 catalysis by replacing electron donation from expensive nicotinamide adenine dinucleotide phosphate with electrodes. The system has potential for applications in drug discovery and development by monitoring substrate metabolism and enzyme inhibition. Other applications include biosensors for toxicity analysis and bioreactors for chemical synthesis. You are currently browsing the Chemical Communications Blog blog archives for July, 2012.